The nation’s air purifier market is soaring as concerns grow over yellow dust, the seasonal wave of dust storms originating from China and Mongolia that now seems to stretch all throughout the year. Last year, the market surged to 600 billion won ($520 million) in sales. The figure is expected to exceed 1 trillion won this year and 2 trillion won in 2017. About 1 million devices are estimated to be sold or rented every year. Korea is a unique market that has grown based on rental services. Coway, best known for its water purifier rental business, is the market leader with more than 30 percent of market share. The company said its March sales have jumped almost 40 percent compared to a year ago. The market used to be crowded by smaller local firms, but it is becoming an emerging battlefield for big companies such as Samsung and LG and higher-priced foreign players. LG Electronics launched a separate air care brand called “PuriCare” last year, debuting premium products with fancier features, such as advanced sensor and filter technologies and remote control. While Coway charges some 30,000 won for a monthly rental, prices of LG devices range from 300,000 to 500,000 won. LG is especially pinning high hopes on the soaring Chinese market with aims to see annual sales of 1 million units within the next three years. Foreign brands are also increasingly tapping into the market as a test bed for their Chinese entry. Japan’s Balmuda, affectionately called “Apple in appliances” here, is a hot-selling brand among trend-conscious customers. Its sleekly designed AirEngine is priced at about 600,000 won. Other premium brands such as Sweden’s Blueair and U.K.’s Dyson are also gaining a footing, with their pricey products worth 1 million won or more. In the meantime, Xiaomi is targeting the low-end category. 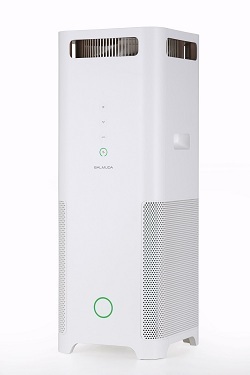 Its Mi Air 2, which resembles the Balmuda air purifier, is less than 200,000 won, almost half the price of an LG product with similar features. Industry sources say premium brands will lead the growth of the market overall. “I don’t think it will be easy for Chinese brands to secure a footing in Korea, considering winning consumer trust is crucial in air purifiers,” said an executive from a local electronics firm on condition of anonymity.